Well, the Super Bowl ended with great fanfare. We enjoyed both the game and the outcome. Sorry to you Patriot fans but those Eagles fans needed the taste of victory - for once. I sit here on Tuesday evening nursing my weary body after another unplanned rest day. Why unplanned? I decided to stick closely to the recommendations my body makes as I continue to prepare for this climb. The training routine I planned to implement was both ambitious and flexible. Thus, I continually strive to push myself with built-in regular rest time every 4th day. Throughout the entire training cycle, I monitor my recovery by checking my heart rate variability (HRV) every morning. How do I measure HRV? Every morning, before I do anything, I don a chest strap heart rate monitor (transmitter) and record my heart rate via two apps. Why two? I use two to corroborate this important measure to ensure that no oddity in either the software or in the algorithm interferes with my recovery or training. These days I use hrv4training and EliteHRV. Both produce fairly dependable results but there are some slight differences. 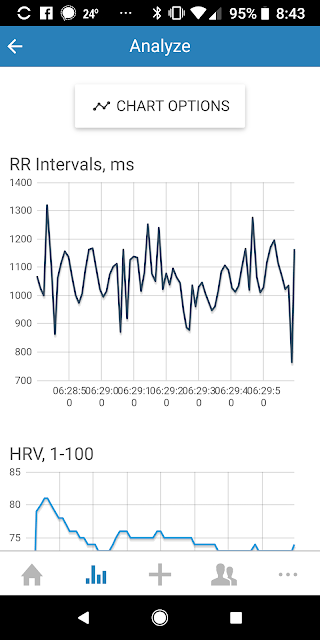 For one, the EliteHRV app provides guidance on breathing rate and alerts me when there are too many artifacts for the reading to be useful - something I wish the hrv4training app provided. Despite these differences, I found the ratings to correlate highly (r > .95) and most mornings they offer me similar suggestions with respect to training (to train, to go hard, to cut back, or to rest). So, once I take these recordings, what do I make of the numbers? Well....read on! 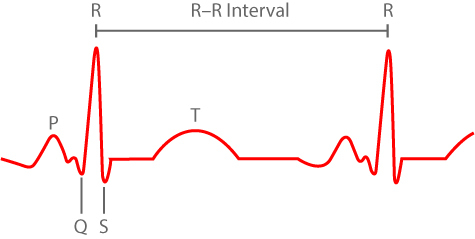 The heart rate "trace" above shows the different electrocardiogram or ECG signal patterns represented by the P, Q, R, S, and T signals in the overall heart beat wave. We are interested in the R or peak waves and more specifically in the time between each R signal. A beating heart that is stressed will have a consistent R-R interval or a low variability for the time between R signals. That low variability is a sign that either 1) you are under stress and your sympathetic nervous system control of your heart is high or 2) you are in a state of active recovery and your parasympathetic nervous system is not contributing much to your overall heart rhythm. Either of these two outcomes is not good. Low HRV predicts mortality - among other things - and often is an early warning sign for overtraining. "Cardiovascular autonomic balance as measured by HRV may be considered as a valid sign of short-term but not long-term fatigue." Thus, we want our sympathetic and parasympathetic nervous systems to be in balance while we recover and, as a result, our HRV should be relatively high. How high do we want HRV? 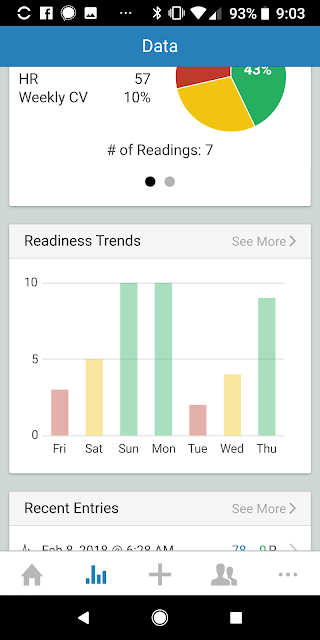 And the figure below shows my weekly "Readiness" trend. As you can see, the bars tell me that I needed to rest and I did. I'm being a good boy. Not all days are great. Yesterday, my HRV was 84 and was strongly influenced by more parasympathetic activity than sympathetic activity - an imbalance. Both apps told me to rest yesterday and I did rest to a degree. I worked out "lightly" compared to the 5 hour day I had planned. Thus, high is not always the best. Balance is what we aim for and often that balance results in higher HRV scores. Does HRV work when sleeping at simulated altitude? We don't know. I certainly don't know. There are no systematic studies on the use of HRV with hypoxic sleep training. I found to date that HRV corresponds well to my overall fatigue (perceived level of fatigue in the morning) and often my HRV scores are affected by two things - my rate of respiration and any abrupt changes in simulated sleep altitude. Let me address each in turn. Respiration rate greatly influences HRV scores. If I pant heavily when I wake up, I will have abnormally altered HRV scores - sometimes elevated but often suppressed. Calm, regulated breathing at about 6-8 breaths per minute result in optimal HRV scores. Thus, if I have a huge change in my simulated sleep altitude, I often wake up breathing in more rapid, shallower breaths that result in lower HRV scores. Breathing rate is extremely important to optimal HRV recordings. Simulated altitude via the Hypoxico unit appears to alter my HRV moderately but not to the point where I can no longer use HRV to monitor my recovery. If I have a huge increase in simulated altitude, I find that it is difficult for me to disentangle recovery from hypoxic stress. One way around that conundrum is that I often increase my altitude on rest days where I know my body will not be stressed that day due to training and almost all the HRV changes would be attributable to oxygen changes. I also need to take into consideration the combination of training stress (as measured by both intensity and duration) and hypoxic stress (as measured by relative oxygen saturation in the tent and morning spO2 levels upon waking) to fully appreciate the HRV changes on days when I do train and do sleep at very high altitudes (low oxygen levels). 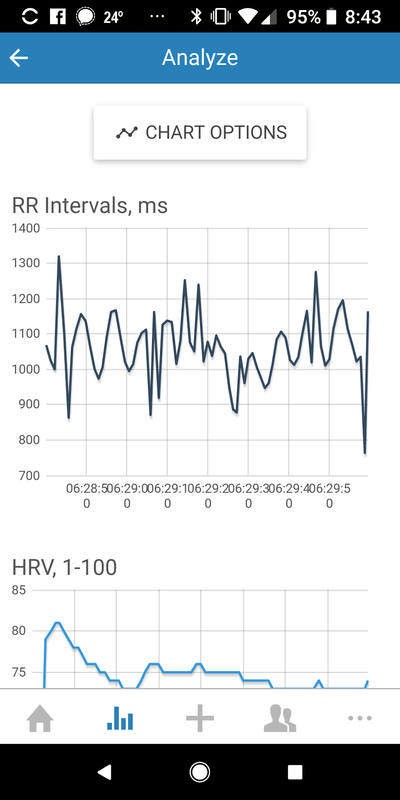 I use HRV now to monitor my rest and recovery. The research to date shows some promise but I realize that the application of this tool cannot be done in isolation of other factors. Hydration, nutrition, stress, breathing, and sleep affect HRV readings and often in ways that I cannot understand - at least not yet. HRV helped me to rest when I normally would push through the fatigue. Work + Rest = Success. I have no problem with the "Work" part of the equation but the "Rest" part eluded me for some time; HRV seems to help so far. Expect more updates regarding my progress, recovery, and overall preparation. Thanks for following. Hope you found this material thought-provoking.